A large windmill blade that sits atop the Denny's on E. Huntington Drive in Arcadia broke off Friday and fell onto the restaurant's roof. 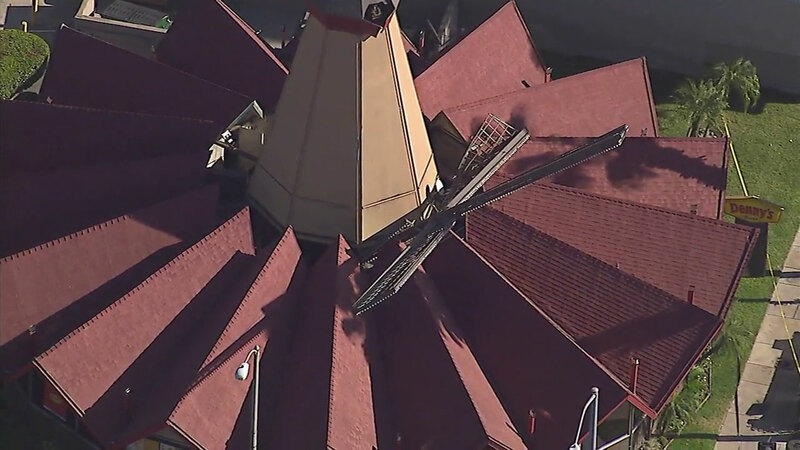 ARCADIA, Calif. (KABC) -- A large windmill blade that sits atop the Denny's on E. Huntington Drive in Arcadia broke off Friday and fell onto the restaurant. The broken-off windmill punched a hole in the restaurant's roof, according to Arcadia Mayor Pro Tem Sho Tay. Police, the fire department and the building department responded. No injuries were reported. The historic Van de Kamp Dutch Bakery windmill was restored in June of 2016, when the city of Arcadia teamed up with Denny's to celebrate its re-lighting.